"ARCH ENEMY is a brand new, shiny thing again." 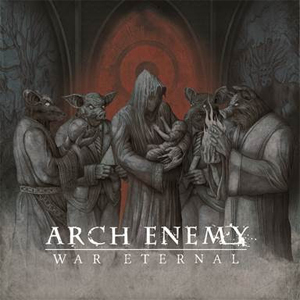 Swedish melodic death metallers ARCH ENEMY are pumped to release their newest album, War Eternal on June 4th. This new offering features a new vocalist for the band, Alissa White-Gluz, replacing long time vocalist Angela Gossow, who still serves as the band's manager. I had the opportunity to chat with guitarist Michael Amott about the new album, the vocalist switch and what's next for this metal juggernaut. Check it out! KNAC.COM: You have a new album coming out. And with this new album, one of the things that the media and your fan base seems to be talking about is the fact that you have a new vocalist replacing Angela (Gossow). How did you decide to pick the current vocalist Alissa White? Amott: I think we picked Alissa White because she was the best singer we could find basically. When Angela had informed us that she was definitely leaving the band, after considering it for a really long time, it put us in a position where we had to seek a new singer. We were writing a new album, and we didn’t have a singer. So at that time, we started talking about who could be a possible replacement, and Angela actually suggested Alissa herself and said that she was someone who she thought fit in for ARCH ENEMY. And we started checking out Alissa and what she could do. You know, checking out her YouTube clips and performance clips, live clips, interviews, and then I started contact with her on Skype, started talking with her. And I caught her [live], she was on tour in Japan at the time, was in another band. I got into a discussion with her, and she seemed really positive about it, so she decided to come out to Sweden with us and try it out, and we did. And we just kind of took it from there. It was a very, very organic approach in a lot of ways. And it actually happened pretty quickly, from the moment that Angela definitely left the band, we started working with Alissa and it was pretty short. KNAC.COM: So you didn’t try out anyone else? Amott: No, we didn’t. We had plenty of time last year, we had a whole year off. We didn’t have anything in mind. It was more like “Let’s try Alissa when she comes to Sweden. When she gives me a call, let’s try her out. Let’s see how it works. Let’s see how it sounds when she tried out the old stuff, the new stuff. Let’s do some demos with her." It was very relaxed. And if it didn’t work with her, we still had time to look around for somebody else. And we didn’t really look, no one else was approached or discussed really. KNAC.COM: So it was just one of these things where you tried it out, you clicked well, and you just decided that you wanted her to join the band than? Amott: Yes, exactly. I think……we were very lucky. She is obviously very excited about it. She has been a longtime fan of the band. Her first metal CD that she picked up herself was Wages Of Sin, one of our ARCH ENEMY albums that we did many years ago now. And it has come full circle for her. It is a very exciting moment for her. Releasing an ARCH ENEMY album with her on vocals, is very cool for her, but it is also very exciting for us because she brings so much to the band. She has got a lot of energy, a lot of creativity. And I think she’s just perfect for this job and perfect for this band. So we are very excited about it. KNAC.COM: From what I understand, even though she is not the singer anymore, Angela is still involved with the band when it comes to management? Amott: Yes, she has actually been doing the management of the band since 2008. It has really worked out well for us, having her do that. She really loves the business side of it, she is doing a fantastic job. She is great at organization, so we decided to maintain that relationship and keep it going. We didn’t see a reason why to hang it up in that regard. Behind the scenes, she is still there. KNAC.COM: Is that why she decided to step down from being in the band on a musical level? Amott: I think she had many reasons for that. I think she was tired of the lifestyle of touring and recording, and that constant sort of grind. After all, being in a touring band like ARCH ENEMY is a real full-time commitment. And you also have to give up a lot of things in life to do this. You know, it’s not really a normal life. I think there were a lot of things. I don’t think there was anything that came overnight. I think she was just worn from being a performer and the touring position. And…..why not? I don’t know, you can’t force anybody to be in a band if they don’t want to be in a band anymore. KNAC.COM: Speaking of touring, do you guys have any tour plans to promote this new album? Amott: Yeah, you can go on our website [archenemy.net] and you can see we’ve lined up dates, we start touring next month actually. We’re doing all of Europe and Japan, we’re going to be all over the world again. ARCH ENEMY is one of those lucky bands that gets to tour the world because we have a fan base that covers the entire planet. We go everywhere. We are really into playing in front of all of our fans. And we are looking towards the United States of America. We’re booking a tour right now and it is coming together. It’s just not announced; it’ll be announced very shortly. And it’s a package that I think is going to blow people’s brains out. You aren’t going to believe it; people are going to be very excited. It’s going to be a really killer metal tour. I think that’s happening in the fall, October or November, we’ll see. KNAC.COM: Are there any more details you can give me about that, or do you have to keep it under wraps? Amott: I can’t really tell you who’s on the tour, no. I guess it’s because there is going to be some kind of press release or something. But I’m very, very excited about it. It’s going to be a band I respect very much that we are bringing out. ARCH ENEMY will be closing the shows, but the main support act is like...are metal legends, a very well respected band. A European band. KNAC.COM: On the topic of the new album, from what I have heard from the new album, I have to say that the production quality of everything is very crisp, very clean, and sounds great. Did you guys do all of that yourself? Did you produce the album as a band? Amott: We did the producing ourselves. It was a very relaxed effort. We had a long, long time of pre-production, demos. We kept fine-tuning the material last year. When we got into the studio, we didn’t really have to decide where we needed to go, everything was already dialed in. It wasn’t a lot of searching for the right feeling for the songs, we knew what we were going for and we nailed it very quickly. We had fun recording, it was very nice. I have to give massive kudos to our mixing engineer. He has mixed OPETH albums, AMON AMARTH albums, SYMPHONY X. He did a superb job on this album, he really brought it all together. KNAC.COM: There seems to be a lot of excitement about this new album that you have coming out. But there is something else you have recently done I wanted to ask you about. You were in CARCASS when they reformed? What was it like balancing being in two big bands like that? 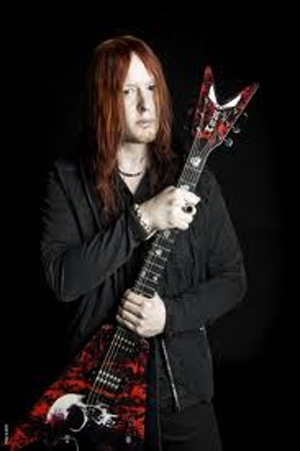 Amott: I was in CARCASS from 1990-1993, I left, and then the band sort of broke up in 1995. And then there was a reunion in 2008, which went on from 2008-2010 basically. And I was a part of the reunion shows. And then in the summer of 2010, I played my last show with CARCASS as a guitar player. So I never really had to balance much. There were no issues with it. KNAC.COM: I also see that aside from ARCH ENEMY and CARCASS, you have been doing some other stuff. I wanted to ask you about when you did guest guitar work on the 2007 ANNIHILATOR album, Metal. What was it like being a guest guitar player on something like that and working with a guitar player like Jeff Waters? Amott: That was cool. I did that over here in Sweden, so I wasn’t in the studio with Jeff, although I have visited his home and home studio in the past. It was real fun. I like to keep those guest appearances to a minimum. I get a lot of requests to appear on things, be a guest, play a guitar solo, and I usually say “Thank you, but no thanks” because I like to do it whenever I feel the music, or if it’s something I am really interested in. I’ve done a few in the past, I’ve done one with THE HAUNTED a few years ago, and one with KREATOR, and the ANNIHILATOR one you mentioned. I also played with Michael Schenker on an album of his a couple of years ago. I kind of pick and choose. If I get excited about it I’ll do it. It doesn’t have to be someone famous. KNAC.COM: When you do guests solos like that, do you usually write the solos yourself, or are you handed something and you record it? Amott: Well, they usually send me an instrumental backing track. You kind of take it from there. You think about something that’ll be awesome (laughs) over that part that they wrote. But it’s got to be a challenge, because they usually write it…….when I’m in ARCH ENEMY I write the music as well. It should be a challenge, maybe a different key than I’m used to playing in. Challenges like that are cool. KNAC.COM: What is something you would say you’ve observed with the music industry that is different than when you first started, that has been a radical change? Amott: Well……when I started putting out music, I started making records, and those records actually sold……when fans had to hear an album, they actually had to go out and buy the album, physical copies of the album. And that is kind of what the industry filled up on. That cash flow. With labels, you could be with a label for many years, and maybe not sell a lot, but they would help you build your career. I think now, labels are a little more careful because the money is not there, you know? It’s not what it was. I mean, a lot has changed. I’m not really talking negatively about it. I think for a band like ARCH ENEMY, we seem to do well anyway. I think it’s tough for new bands now. Fans aren’t really willing to part money for music. Many people are not really paying for any intellectual property basically. And that’s just the way things are now. I don’t really think there is anything we can do about it. I’m just kind of stating the obvious here. And I have seen a lot of trends come and go. You know, it’s in, it’s out completely. People hated guitar solos and now guitar solos are back in again, then out, than in…..I don’t know…..I think the most important thing you can do is stay true to yourself and the music that you love. I think that’s all you can do really. I’ve been there through the good times and bad times, and I’ve just been sticking to my guns and playing the music that I want to play. There were definitely a lot of trends. I remember there was a time when a DJ replaced the lead guitar. I think all of these things are healthy though. I love all of those new, sort of, offshoots. But sometimes trends just focus on one style of music that every band starts playing the same kind of music. The same sound, it kind of becomes boring, it kind of cancels itself out. It’s just sort of how the industry works. KNAC.COM: Do you think having a new vocalist is going to mark a new period for you guys or a new phase in your career? Or do you think having a new vocalist is just going to keep things the same as it was? Amott: I think it’s going to be a new chapter for the band. This is the first album with my brother Chris on guitar, it’s going to be the first with the new singer in years. We became more famous with Angela, and now she has passed the torch. We feel reenergized, it feels like it’s brand new in a way. ARCH ENEMY is a brand new, shiny thing again. It definitely feels like a new chapter. Pick up a copy of War Eternal in the KNAC.COM More Store right HERE.